I’m not a doom and gloom guy. I’m an optimist. I’m an optimist because although the “economy” is screwed up, innovation is here to stay. I put economy in quotes because there’s no such thing. The word itself is in doubt. 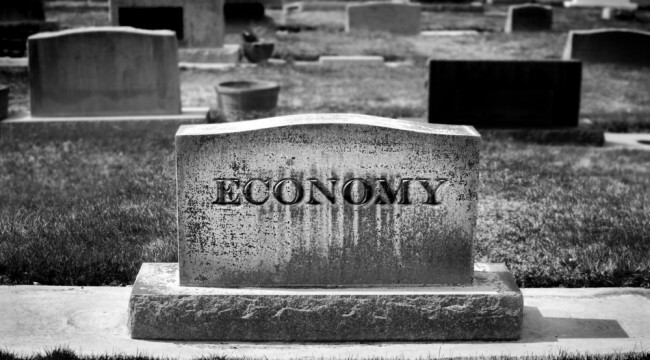 “Economy” means a way of being prudent. When you look around at the way the country is being run, “prudent” isn’t the first word that comes to mind. “Economy class” better describes the world of many people these days. We’re living in an economy class world being ruled by first class plutocrats. The average person is screwed. I’m on the board of a billion revenues temp agency. I can tell you, it’s not pleasant what is happening. Don’t believe the employment numbers. Look at the part-time numbers. Look at underemployment. Look at people leaving the “numbers” behind. Which is the good news. Because there is a separate economy. A real economy. An economy where people are driving cars with no drivers. Where robots perform surgery. Where drones kill people from thousands of miles away. Where fracking goes horizontally into your rivers to turn the U.S. into a new Saudi Arabia. Ha! In other words, the innovation economy. So the way to deal with scary markets is to trust capitalism. It has been a success for hundreds of years, even if individual governments or entire stock markets haven’t always been. So if you want to avoid riding over the cliff in the bad economy, you must go into innovation economy. Here are the trends coming in the next ten years and the stocks to keep an eye on. Some old, some new. A) Lithium shortage Every car needs batteries. A car is just a computer with a car app on it now. And computers need better batteries. All the lithium is in…guess where…China and a tiny unheard-of country called Afghanistan. One company, ENS, Enersys, is a Lithium play. ENS makes the batteries and isn’t overvalued by today’s standards, although my guess is they will continue to surprise. By the way, I’m not recommending stocks here. I’m just throwing it out there as an example. B) Old people Every ten years the average age of death is rising by 2.2 years. You know what happens to old people? The three top causes of death: cancer, heart disease, and Alzheimer’s. I am a big fan of diagnostics. I own TROV (Trovagene). Here’s the key, what if Steve Jobs peed in a cup every week to keep updates on his pancreatic cancer instead of get invasive biopsies. That’s the difference between TROV and what hospitals do now. The market for this is basically every person above the age of 40. Meanwhile TROV is doing deals with every medical facility out there to test the test. I own it and I’m not selling until $70. C) The offense industry Too many people mistakenly call this the defense industry. What exactly is America defending against. We have military in something like 74 countries. And the government doesn’t hire tiny companies to offend for us. They hire big companies that then hire the tiny companies. Lockheed Martin (LMT) is my choice. When we need more drones some general calls LMT who then makes the call. It’s not overvalued, it pays a nice dividend and it’s raised its dividend for 10 years in a row. BAM! If you really like drones (and I do. I’m still waiting for Amazon to start delivering me pizzas with drones) then keep an eye on AMBA (Ambarella). They make the camera chips inside the drones. In the land of the blind, drones are king. D) Clean energy And by clean energy I mean coal. You ever see those vast tracts of land with those ugly wind farms that don’t work? Land that could’ve been used for food? Coal goes straight down, and still fuels half the country with electricity. Apple (probably going to be the first trillion dollar company), Amazon (all bookstores are dead), and Google (the above-mentioned driverless cars are only the starting engine). And if you’re concerned about inflation or the devaluation of your money, there are also innovations in currency underway. Bitcoin has gotten a lot of attention, but I think it’s smart to look into other currency technologies like Square, Stripe, or PayPal. I think the best hedge against any kind of currency risk is investing in innovation. This is my starting point. If we trust that the world will fix itself, we are putting our trust in the wrong place. It never has and never will. The world will be fixed by the next generation of the economy. And nobody can predict the future. But I look for what demographic trends are starting to ripple with excitement today. What trends seem unstoppable by the direction the car is going. And the key is to diversify across many of these trends in innovation. I also try to diversify across the investors that I piggyback. I’m not just buying all of Warren Buffett’s picks. I follow 20 or 30 of the best investors out there. In 2005 I wrote a book, “Trade Like Warren Buffett.” In the book I show how Buffett’s first criteria is not value but demographics and trends. This is the way to build for the future. I’m scared but I have hope for the future because of the innovation that I am seeing every day. Don’t believe anyone who focuses on doom and gloom or timing shorts or hate for the news or hate for the people who think they control the economy. These people will lose money. Focus on what works today. Because the best indicator of a successful tomorrow is a successful today.